S M Ong: PSLE: Why can't my son be a China girl who could hardly speak English? PSLE: Why can't my son be a China girl who could hardly speak English? My son got his Primary School Leaving Examination (PSLE) results on Thursday and he wasn’t Singapore’s top scorer. Which is fine. But then my son was not even Singapore’s second top scorer. Which means his life is as good as over. He might as well become a loan shark runner. Too bad the Government decided last week to clamp down on the vocation. I guess as a last resort, he could go into banking. I read in the papers last week that banking as a career choice is not as hot as before. My son is certainly qualified since he’s good at maths and has little sense of moral responsibility. Who knew that to be the national PSLE champ, you have to be a girl from China who couldn’t speak English when you first came to Singapore? Which means that the waitress who couldn’t understand my ribs order at Cafe Cartel the other day has the potential to be a top scorer. I should’ve adopted. 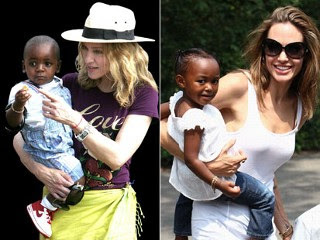 Madonna and Angelina Jolie adopted kids from overseas. And I’m almost as famous as them. My son even went to a neighbourhood school like the top scorer did. Maybe I’m just living in the wrong neighbourhood. The top scorer is from Qifa Primary School in West Coast. But I don’t want to live in West Coast. No MRT. You know what? I blame myself. Why couldn’t I be a physiology research fellow at the National University of Singapore (NUS) like the top scorer’s father? I even know what “physiology” means (I think). And why didn’t I marry a physiology research assistant at NUS like the top scorer’s mother? My wife likes to sew bags. No wonder our offspring turned out to be such an academic cream puff. But to have both parents who are such super-geeks is just stacking the gene deck to produce a super-duper mega-geek bred to take over the world and rule us all! Talk about parental pressure. Imagine if the kid hadn’t become the top PSLE student. Then rain would fall up and Adam Lambert would like girls. Should I reveal my son’s less than world-dominating PSLE score? Let’s just say I added a zero, bought 4-D with the number and was disappointed once again. Neighbourhood secondary school, here we come!